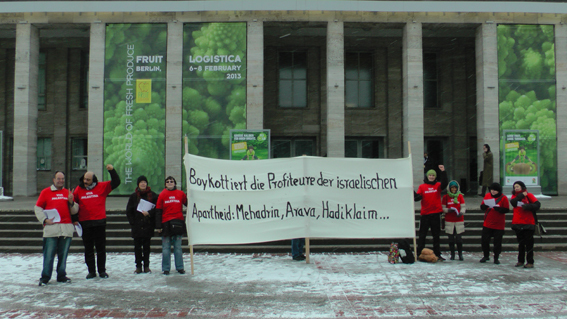 In Europe, many of the more than 40 protests that took place targeted Mehadrin, a large Israeli export company that supplies citrus fruits, dates and other fresh produce to supermarkets across Europe. 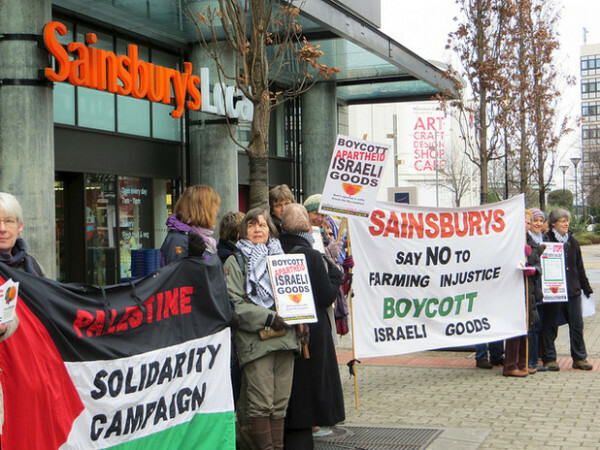 The company operates in illegal Israeli settlements, is involved in the theft of Palestinian land and water and employs Palestinian workers forced to work in illegal settlements in unsafe conditions for as little as €11 per day. 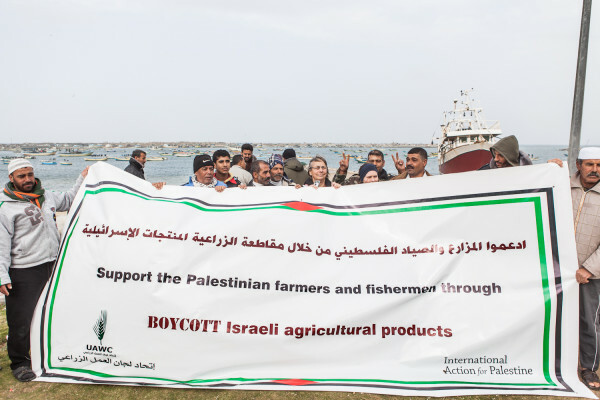 On February 9, 300 farmers and activists in Gaza marched towards the buffer zone near the border with Israel to demand boycott of Israeli agriculture firms. A rally was held and olive trees were planted. 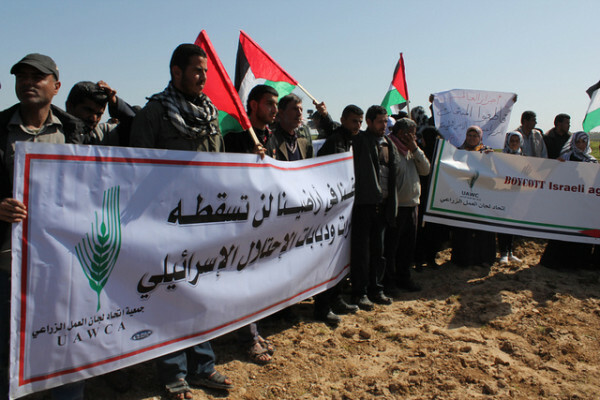 A rally was held at Gaza Port on February 6. In the West Bank, activists planted Olive trees on the land of Madama village where illegal settlers have cut down hundreds of olive trees. A conference on boycotting Israeli agriculture firms was held in Salfit on February 11. 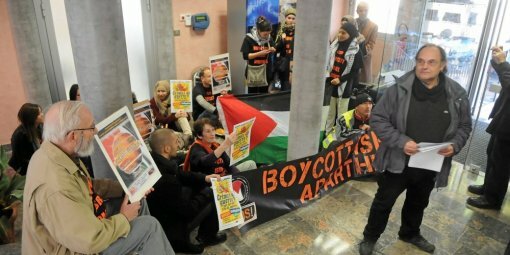 In France, activists occupied the customs office in southern French city Montpellier to protest the nearby port of Sète being used to import produce from Israeli companies such as Mehadrin that operate in illegal Israeli settlements. More than 50 campaigners occupied the offices for more than an hour. Protests were also held at supermarkets and other locations in more than 14 other French cities including Lyon, Lille, Marseille, Villefranche and Bagnolet. Participating cities included Aberdeen, Edinburgh, Glasgow, Newcastle, Manchester, Liverpool, York, Halifax, Bradford, Sheffield, Birmingham, Cambridge, Bristol, Portsmouth, Salisbury, West Surrey, Southampton, North Devon, Brighton, Cardiff, six London boroughs, and Hull. Read reports and view more photos here and here. Dozens of activists took part in a large carnival procession through the centre of Brussels to call for a boycott of the fruit of the occupation. 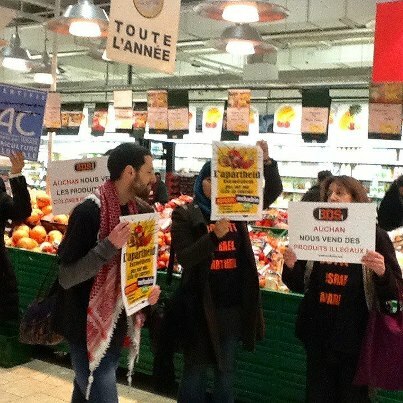 Activists staged a protest against the fruits of Israeli apartheid at the Black Market in Beverwijk. The Oriental Market stocks an array of Israeli vegetables and fruit, many of which come from illegal settlements. In a death scene or "die-in" the activists showed the effects of Israeli violence. After a short speech the activists dispersed with flyers and signature lists among market stalls and shoppers. Security personnel and police soon ventured to stop the action, but the merchants themselves showed clear sympathy for the action. Campaigners in Switzerland held a demonstration outside the offices of Mehadrin. Activists in Berlin held a demonstration and handed out information outside Fruit Logistica, one of Europe's biggest fresh produce trade shows. Many of Israel's agricultural export companies including Mehadrin were present and seemed startled by the presence of activists highlighting their role in the destruction of Palestinian agriculture. Actions also took place in Sweden, Luxembourg and Italy (photos and reports to follow).